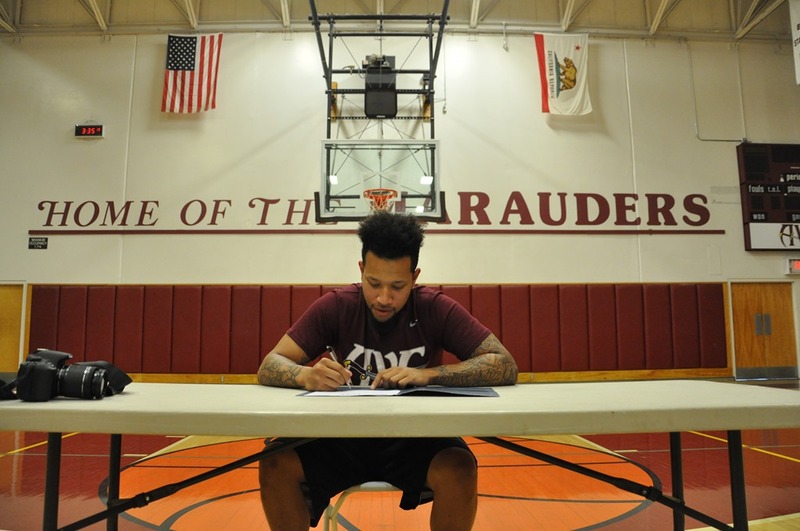 Its been a long trip for Joseph “JJ” Moorer to Antelope Valley College. His basketball career started at Norbonne High School, with a transfer to Torrance High School where he graduated. JJ then headed for a year to a prep school in North Carolina when he was offered a scholarship to D-2 University of Minnesota, Crookston. Due to grade issues Moorer left U of M, Crookston and in his travels he ran into AVC’s Zack Hollis at D-1 Lamar University in Texas. They hit it off well and Zack suggested to Joseph JJ Moorer that AVC might be the place for him to get is mind, grades and basketball game together. Joseph sat out the 2014-15 season and got his grades back in control and is now ready to head back into the wars of college basket ball and I believe that AVC will be very happy with his upcoming success. JJ has: maturity, shooting, ball-Handling, defense and is a college basketball player. Not much more to say other than you need to watch this guy. Joseph was invited the All-American Tournament-Elite 80 in Las Vegas to play against to top JUCO players in the Western US. Moorer had over 150 University coaches watching him and boy did he give them a show! His three games were so good…20+ ppg…played the point and the shooting guard…that he was named to the All-star team for the tournament. Outstanding performance! There is line outside of his recruiting door. An explosive player both on the offensive and defensive end. An outstanding year and big decisions to make where he is going to play his university basketball. AVC seldom played a basketball without a group of coaches scouting him. JJ’s grades are solid and he is ready for the next level. JJ Moorer is headed for visit to top D-2 school…West Georgia University. The crowd in the AVC basketball gym gathered around Joseph Moorer to congratulation him on his full ride scholarship to one of the top basketball and academic D-2 universities, West Georgia. It brought back memories when “JJ” first arrived at Antelope Valley College. He was well known throughout the college basketball world as an outstanding player that could take a team on this back and carry it to a win. He also came to AVC “out of balance” with his academics. Head coach John Taylor and his coaching and academic staff put together a plan to get Moorer’s balance back in place. This included sitting out one year to dedicate himself to academics before he joined the AVC basketball team. JJ stepped up to the challenge academically and led AVC to the elite 8 in the state this year and 25 wins. Congratulations to Joseph Moorer on his scholarship but more importantly on the man he has become. I wouldn’t bet against JJ on anything he sets his mind to. He now has all the tools he needs to succeed. In 2016, Joseph Moorer, 6’0″, 180, received at full ride scholarship to D -2, West Georgia University after a outstanding year at Antelope Valley College in 2015-16. Moorer is one of the most deadly three point shooters I had seen in JUCO basketball. Moorer was injured shortly after he arrived at West Georgia and was awarded a medical red-shirt last year. JJ decided that he would transfer to another D-2 university after his injury healed. He made sure that he kept his academics up to date at West Georgia. Joseph brought his transfer choice down to D-2 Northwestern Oklahoma State University, part of the Great American Conference. Moorer will be sitting out this year due to transfer rules by the NCAA. More good news, during his red-shirt year, he expects to very close in completing his BA degree at the end of this and his Masters degree after his two active years a Northwestern Oklahoma State U. One of the main reason Joseph chose Northwestern Oklahoma was Coach Dirden who played in the NBA with the Suns and Steve Nash. Dirden coached at D-1 Universities his whole career before his took this job at NW OSU. 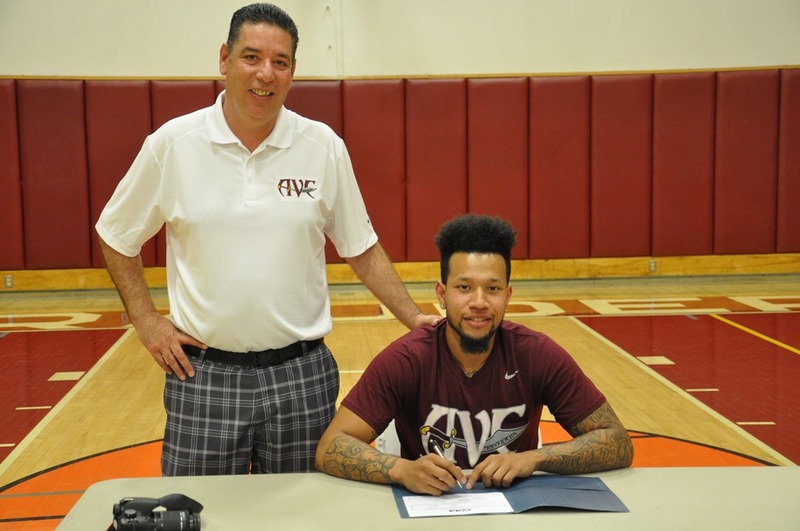 JJ Moorer, superstar shooter stopped over at Antelope Valley College this week to pick up his AA degree. Currently he is red-shirting at Northwestern Oklahoma State University where he is working toward his BA degree and his Masters Degree. He will start playing there starting next year in his last two years of his university basketball edibility. Great work young man.